For the first time ever, Microsoft announced a timeline, albeit an approximate one, for expecting the next version of SharePoint. SharePoint 2019 will be rolled-out, with Office 2019, in preview form by mid-2018, with the full version not expected until the end of next year. Expect that the new version will have an enhanced look-and-feel, improved social integration particularly with Yammer, LinkedIn and Skype, improved search, and more cloud options. Office 2019 will include the usual Word, Excel, PowerPoint, and Outlook client apps, with server versions of SharePoint, Exchange, and Skype for Business. Preview copies of Office 2019 should be released next summer. Excel will also include new formulas and charts for data analysis, and PowerPoint will feature the “morph and zoom animation” features in Office 365. Design – Define the look and feel of the hub site, and the theme applies to all associated sites. Navigation – Define top navigation inherited by associated sites. 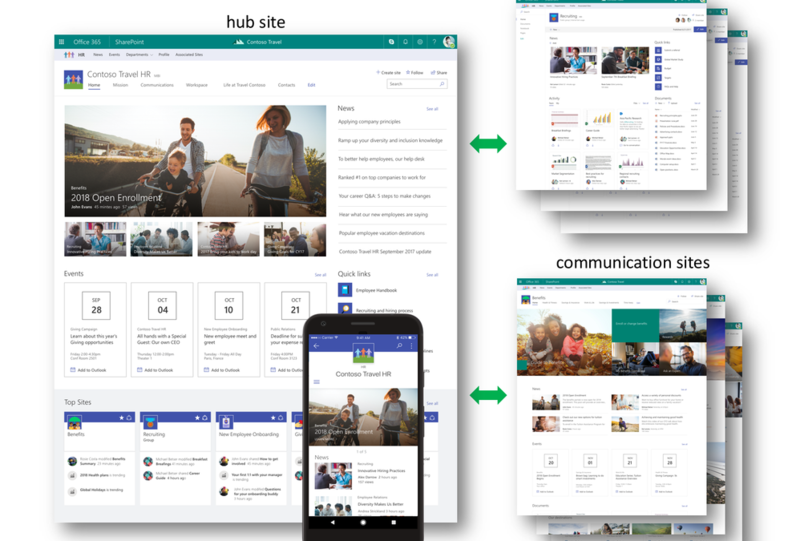 News – publish a news article on an associated site, the news article surfaces on SharePoint home, in the SharePoint mobile app, and the hub site’s home page. Activities – site activities will roll up from each associated site so that they are visible on the hub’s home page. Scoped search – search results from a hub site include content from all associated sites. The SharePoint mobile app provides all sites, news and team members, and search to find content and across the organization.